The architectural blossoming of downtown Boca Raton has brought some massive changes to the landscape. To paraphrase a quote about architects:”Lay heavy on them earth, for they have laid a massive weight on thee.” But in addition to all the new condos, rentals and office space, the area has seen a remarkable growth of high-end restaurants. The most notable of the new crop is Boca Raton’s Roots Italian Kitchen, the inspiration of Yuri Kouzenkov and Chef Michael Latimore. This jewel of a restaurant is conveniently located on Federal Highway just a few steps from Mizner Park and Royal Palm Plaza. Large windows provide unobstructed views of the new architectural masterpieces while the tones of black and white provide a sleek yet comforting modern ambiance. An open kitchen is where all the magic takes place. An outdoor patio provides al fresco dining in a quaint courtyard setting Although Roots is “rooted” in classic Italian traditions, what emerge are signature dishes that are beautifully plated masterpieces of flavor. Expect to find classic as well as modern interpretations. The chefs are also committed to using the best locally sourced ingredients. Much of what is served is created in house. For example, the all homemade dairy portion of the Trio of Truffled Fresh Burrata, Mozzarella Nodino and Prosciutto di Parma ($25) features a creamy blend of burrata mozzarella and white truffles. Mozzarella Nodino are small knotted mozzarella endowed with a peerless creamy bite. The third part of the mozz trio is a burrata, a mozzarella creation packed with a scrumptious filling. Slices of red and yellow tomato, cuts of red pepper, a floral garnish as well as cuts of Prosciutto de Parma hit all the right notes. Such a spectacular cheese creation calls for one of the house’s superlative vintages (many available by the glass). A full service bar offers many other options Adventure and vivacity mark the Snapper ala Marechiara ($36) an enterprising pairing of a superb filet elegantly presented with clusters of clams, mussels, and a gigantic shrimp over a bed of sautéed spinach. The Chicken Marsala ($24) strikes the perfect balance between sweet and savory. An abundance of satiny mushrooms and an enticing potato medley are the ideal partners for the scrumptious filet starring in this delectable dish. 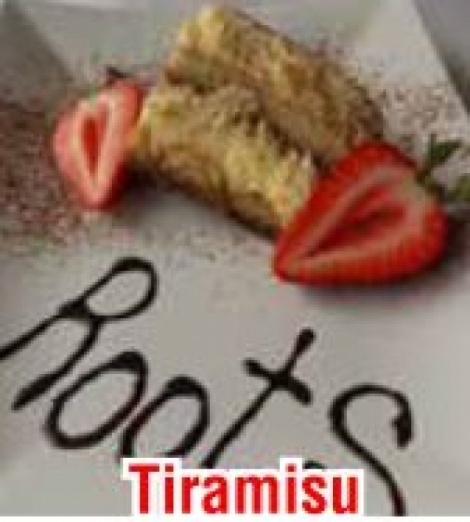 You will also not want to miss the Chef’s Tiramisu, a sumptuous wedge of creamy, heavenly bliss as well as their extensive variety of homemade signature cheesecake such as sour cream, oreo cookie, chocolate mousse, cannoli, and much more. Throughout our visit, service, provide by our waiter, Artem, was polished and precise. Tuesday through Sunday, from 5 to 6 pm, enjoy a multi course Sunset Special ($29) which includes a glass of wine. For information about take-out, delivery, catering and more log onto www.rootsitaliankitchen.com. LUNCH Tue. thru Sat. 11am-3pm; Closed Sun.-Mon.